Oh my goodness! Comics have been away for a while, haven’t they? I do apologize for that. I’ve been doing some freelance work and been very busy with family affairs–it was the kiddo’s 2nd birthday recently! I’ve fallen super behind on my comic output goals this year so I’m cranking it up to HIGH SPEED. That means you should come back Thursday as I’ll be posting 2 comics a week as much as I can! 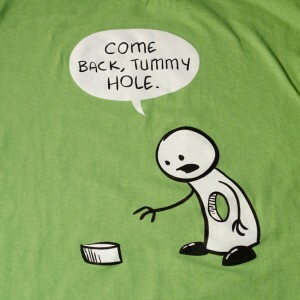 Also, check out that Tummy Hole tee-shirt link to the right! There’s very limited stock in some of the Life is Pain tees, so if you’re interested you need to act fast.